At the southern part of the island lies Perissa. A seaside village with more than five kilometres long dark beach. Main characteristic is the enormous rock, called Mesa Vouno rising 264 meters from the sea and offers a great landscape by night when the rock is lighted. Worth seeing at Perissa is the magnificent five-domed church of the Holy Cross which was rebuilted on the same site and on the same dimension, after the its destruction in 1956. The Byzantine church of Agia Irini (St. Irini) worth visiting too. Is the patron saint of the island and local people honour her on 29th of August. 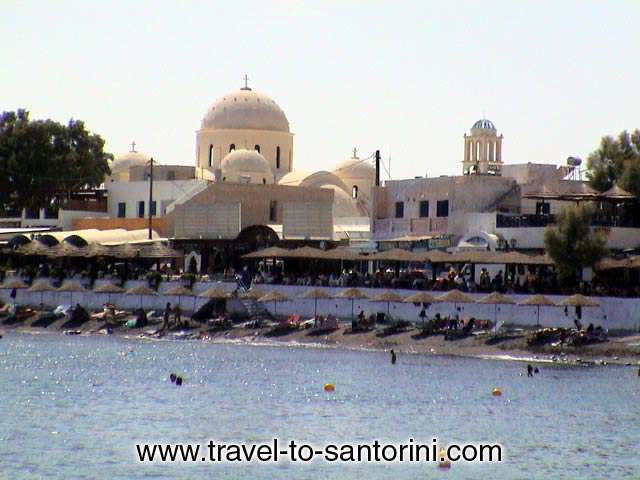 Agia Irini died on the island while her exile, on 304 a.d. One of the campings of the island is located in Perissa. The village also, offers a great variety of luxurious hotels, restaurants, beach bars and night clubs.